Just like Duct Tape or Spray Oil, there are many ways to use so many products, or by products. Some are very useful, others will save you time and money. Some are just out and out silly. Read through our ideas and see if they might help you out with all those feed bags you just hate to throw away or burn as is, seems like such a waste. Deron and I have many feed bags per month and use each and every one. I really do use our feed bags for some of the items listed below. Ok, Ok, So I did sit and think up these ideas alone. AND LIKE ALL OF OUR PAGES AND INFORMATION, THIS PAGE IS COPYRIGHTED. PLEASE DO NOT USE OUR INFORMATION, WRITTEN BY US, WITHOUT PERMISSION AND OR CREDIT DUE WHERE CREDIT IS DUE. 12) Cut out the inside liner for wrapping paper, decor or don't. Years after writing this list a Lady named Connie, on a Donkey eList I am on, came up with the idea too. 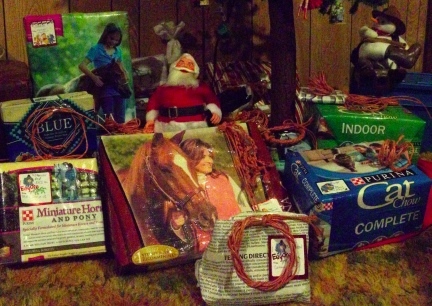 She took it a step further and used the Baling Twine to decorate the packages. I asked if I could post the photo here, I think these gifts are wrapped adorably! 20) Cut open and spread the inside (clean) liner out on your kitchen table, let the kids color on it for hours. Use as a table cloth that evening. 41) Have one set up in your home for that mail you get that you would not want others to have. Use as fire-starter, or just burn, to keep the information out of the wrong hands. 50) Use one on each side of the inside of your vehicle for "floor board guards"
54) A feed bag makes a great place to put dog poop or animal manure when picking up after animals. 64) Cut into smaller pieces and roll or wad into loose balls. Throw these at your TV during the news when you hear the stupid stories they are telling, when you hear how they are spending your tax dollars, when the bad guys win, ect. 65) When moving or traveling use a the liner (clean) to wrap sharp items and fragile items in for safe keeping. 66) Line Bookshelves with them - dirt does not show up well on that inside (clean) brown liner. People won't notice dust as bad. 67) Use the inside liner (clean) with a marker when teaching your children in home schooling or teaching them to write. It makes it fun for them and gives them lots of room to work. 6 Keep a couple under your vehicle seats for many things you can do on the road with then. Deron and I have lots of fossils on the property where we live. I have often said we should stop as we come in here on the prairie on the way to our home. The feed bags would be a great place to put the fossils when found. 69) If you have one under your vehicle seat as well as a plastic bag or a couple of latex gloves, you could stop and pick up dead birds (pheasants in our area) and put them in the bag, if you wanted the feathers for crafts. 70) Freak out the checker next time you go to your local store. Hand her one and tell her just to put your items in it....no paper, no plastic, no tote. If you can keep a straight face, what fun you will have with this. 71) If you need to move rocks around on your property, an empty feed bag may be a great way to carry them. 72) Do you have cats? Set an empty feed bag, open wide, in the middle of the floor. Enjoy the show your cat will preform for you. You might want your video camera and or camera for this one. 73) You can also cut one in half, so that you have a shorter bag. Cover it with fabric (sew a bag so that the feed bag is inside a fabric outside) and make the inside of the feed bag area cushioned for a dog or cat toy that crinkles as they move it and is a comfortable bed. 74) Fold to the size of a kitchen chair seat. Tie a stack together to use for a booster seat for a child or short person. 75) Cut a few liners (clean) and cut them to approx. 24" x 9". Stack them neatly together and staple or sew a seam down the middle of the 24" side making each side approx 12" when. Create a child's book with a child. 76) Cut a few liners (clean) to approx. 8" x 20". Stack them neatly together and sew or staple down the center of the 20" making each side approx. 10". Fold on the seam. Use this for a fun, cheap and easy Farm Journal. 77) Cut a liner (clean) and use for a coaster. You can make several and decorate them in advance of having company over. Think of the fun conversations you might have. 7 Cut the front side, with the pictures of the animal on it. You could use just the animal photo. Cut into odd shapes and use for a jigsaw puzzle. This would be great fun at a 4H meeting and or other animal people gathering. 79) If you live alone and do not have a dog or a man around. For an inexpensive security system, ask a friend with a dog for an empty dog food bag, the bigger the better. Fill it about 1/2 way up with rocks and scrunch down the top. Go to the Flea Market/Thrift Store and get a mans large sized worn out work boots. Set these items just outside your door. For more drama, or to make it more intimating, buy about 10' of logging chain with two dog hooks. Put the dog hooks on each end of the chain. Put one end wrapped around a tree or your banister and the empty dog end at your door. People will think twice before breaking down your door. 80) Cut the inside liner (clean) into pieces approx. 3" x 5". Use as index cards. Write notes on them and or hang them around town, at feed mills and or other places, with a want add or a for sale sign. 81) Take a couple "Apple Picking". They make a much stronger bag to carry apples in then the plastic bags for retail stores. 82) Tear a paper bag into pieces and put under rabbit pens for your worm bed. They feed your worms and help keep the ground moist. 83) Keep weeds at bay in your garden by laying out split open bags between rows and adding water. If you live in a windy area, put rocks on the feed bags to hold them down. 84) Place over rose buds and other plants when frost is predicted. 85) Very carefully cut out the front side of the feed bag. Save for a few years. Frame when the company changes their look and hang in your living room. It will one day be quite the conversation piece....at least for your friends among themselves. You never know, you might start a new trend. 86) Cut out the front photo. Then cut out liners for several children, your own or a 4H group. Have a contest to see who can come closest to drawing and or coloring the front photo (the one you cut out). 87) Empty one feed bag into a container, say a horse food. Now empty dog food into the horse food bag. Next add chicken food into the now empty dog food bag. Next add goat food into the chicken food bag. Don't tell your family and or caretaker. But be sure to be there when they go to feed using these foods so that no animal is harmed. This is particularly fun on April 1. 8 Carefully use one for desensitizing a horse or other animal you are training. Let the animal see it in your hand. Set it on their back, let them walk across it, ext. 89) Cut the inside liners (clean) into large signs. Write horses or other animal names on them in big letters with a marker for stalls at Fairs, Shows, 4H or other events. You could also add trivia about the animal. 90) Use a liner (clean) to make a game board and or play money. Make a your own game or try to make one already on the market. Tweak it to your own rules. This is great fun for children. Use for a 4H project. 91) Use the liners of feed bags (clean) to make your own large manila envelopes. 92) Use the clean liners to make fun scrolls. Write Bible Verses on them. It will make if more fun for the children to memories the verses. 93) Cut the inside liner (clean) and make olden day type letters. Seal with candle wax and press a ring or something into it for even more fun. 94) Cut two liners into large circles. Glue or sew the two together all but the top. Stuff with other feed bags. Paint orange, like a pumpkin and put out for a fall decor. 95) If you live in a small dwelling. Cut out a liner (clean) and draw a large Christmas Tree on it. Paint the tree green and decorate with paint and or fabrics. After you have it the way you want it, cut it out. Tape to your wall for a flat and out of the way Christmas Tree. You can also ad lights by taking them back and fourth over the tree and taping it carefully. It is important not to leave this tree lit when you are not in the same room. 96) Use a inside (clean) liner or two and draw and decorate a castle front. Cut it out and tape to the wall for children to play "Medieval Times" in front of. 97) If you are your children need to make a panorama use clean liners for your decor. Tape or glue to your box when it is exactly the way you want it. This way, if you mess up your scene, you can start again without looking for another box to use. This is also a great way to save the decor without the bulk of the box. 9 Start an online list called "WHAT CAN YOU DO WITH AN EMPTY FEED BAG?" with the right key words you might be surprised how many people would join and talk about empty feed bags and what all you can do with them. 99) Use a liner (clean) for a BIRTHDAY or CHRISTMAS list. Write with great big letters using a marker to make sure your family and friends can not say "I did not know you wanted one of those". 100) The next time you have your "animal loving friends" over and you are sitting around talking, make it a game of such, called "What is the craziest thing you have ever done with an empty feed bag?" 101) Sit on your front porch staring at one thinking "What else can I do with this bag?" It will keep you entertained for hours. 102) Nichole Duman, www.DumansArk.com make this Calendar Page for March. It is called Marna's Birthday Month. Marna's Birthday Month was coined by my Husband Deron, who buys me gifts all month long, usually daily, for my Birthday. Thanks Nichole! I cherish this! 103) Nichole had another very cleaver idea for the use of the inside of a paper Feed Bag, She writes pedigrees on them, then she rolls them up for storage. Nichole has lost more than one Hard Drive and knows that computers are great, but fallible. 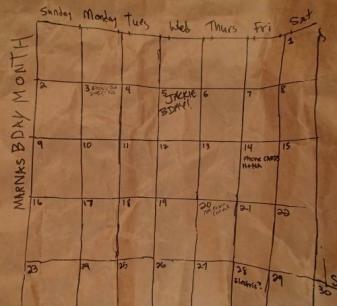 104) Deron had the idea of using the inside of an empty paper Feed Bag to write a Treasure Map on. 105) Deron also came up with the idea, after hearing that Nichole had rolled hers up for storage, one could use the rolled up empty paper feed bag, to use in plays for scrolls. 106) I use Corn Bags, the poly woven bags, to carry our laundry to and from the Laundromat in. The bags are waterproof and breathable, PERFECT for bringing home our wet laundry so that I can hang it on the clothes line. I turned them inside out and threw the Feed Bags into the Washing Machine with my towels to clean them before using them for my clothing. We are going to be taking Backpacking as well as Bicycle Touring Camping Trips this year, and we hope to continue. We bought a LOT of equipment, but did not really have something to hang our food in a tree with. So I took two feed bags, put one inside the other, sewed the corners to make the square, that is I sewed them sideways to make like a tote bag. Then I added handles, put a large velcro strip from one side of the inside at the opening to the other for tight closing. I cut and added adjustable buckles for compression straps so that it can be tightened down when not full and also shortened in size. Then I added a webbing strip with places left not sewn for putting sleigh bells on with parachute cord. I used five. Is it Bear Proof? What is? No. But it is better than just a tote bag hanging. Propped up high on a tree branch, it should help. The bells are not just to try to scare the animals away, they are to wake us to scare the animals off. The feed bag will be easy to clean, I can even throw it in with a load of old towels on cold or warm, and hang it to dry, having it ready for the next camping trip. The photo shows it sideways, the bells are under the handles on top. 2) Make a dress out of a few. 6) Make really KOOOL tote bags to carry around town and be envied by many people. Some who will think, "Oh man, I can't believe they cut up those burlap bags to make totes!". 7) Save several and have an old fashioned "potato sack race". Cut up and use for Breyer Horse and other small animal scenes. Make small bags and stuff them to look like feed bags. 9) Great fabric, that is hard to find these days, for olden day costumes. 10) Cut the burlap bag into small piece to make small feed bags for Breyer and or Model Horse Photo and or Live Shows. Also cute for Doll Houses. 11) Buy a pattern for a rag doll (look at Thrift Stores, they usually have them for about .25) and make one out of the burlap bag. Real cute in an antique doll chair or crib. 12) Cut one in half long ways, twist and roll then wrap around a wire to make a Holiday or Everyday Wreath for your door or wall. Also cute in a barn for decor if you can keep them out of the reach of the animals. 13) Fill 1/2 or 2/3 full of Cedar Shavings. Sew open end shut. Use as a bed for a Flea Free Bed for a cat or dog or both. 14) Add two, or three or five other burlap bags to the inside of one for a nice soft bed for your barn cats and or farm dog. 15) Buy a pattern for a stuffed animal, such as a dog or a donkey. Use the burlap bag for the fabric. Put a checkered bow around it's neck and place on display in your home or give to a child for a fun and unusual gift. 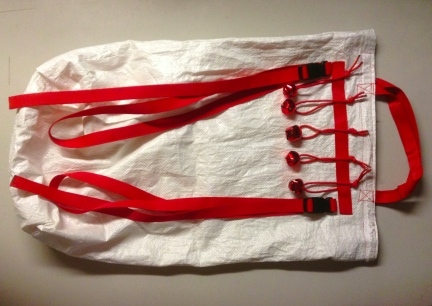 16) Surprise a good friend and use the burlap bag, with a big red bow, to wrap a Holiday Gift in. Add a copy of ideas of how to use the bag to the bow for more fun. It could be the gift of conversation at many parties! 17) Use for "panniers" for your donkey or goats. Tie shut with a baling rope. 1 Cut and make book covers out of one. I bet you could sell these for a pretty profitable price...marketed correctly. Line them for a nicer item. 23) Cut out a mitten shape times two, sew the mitten together, leaving a hand opening of course. Use it to scratch those bug bites. 24) Cut and make several Holiday Bags to put gifts in. Use pretty ribbon to tie them shut. Some folks might like the wrap bag better then the gift therein. 25) Fill with sand and use for a door stop. 26) Cut to the size of a saddle blanket and put the burlap bag cut out between that saddle blanket and your saddle. Decorate with fall colored flowers for a fun Fall Parade Decor!